Despite the competition that exists when it comes to new online casinos in 2018, Dream Vegas has still managed to generate quite the buzz in its limited time in the iGaming industry. Launched in May (2018) by White Hat Gaming acting on behalf of Caddell Ltd N.V, Dream Vegas holds licenses in the UK and Malta, two of the most trusted and well respected online casino regulators in the world. If you want to know why there’s such optimism surrounding Dream Vegas, you need look no further than the sites the have preceded it, these include Casimba, Grand Ivy, Miami Dice, Spin Rider, and Spinland. Having network brethren in some of the most popular online casino sites in recent years has certainly not done Dream Vegas any damage, but your brothers can only gain you so much respect, after that you’re on your own (as anyone with an older sibling will likely attest to) and that’s where the challenge comes in. So, is Dream Vegas an online casino that looks capable of stepping into the spotlight created by its predecessors and take the iGaming world by storm as many expect it to? Or is this level of anticipation simply going to result in disappointment? All the sites on this network look exquisite, and Dream Vegas, while not being the most creative in terms of design, does the same. The artwork and design here is undoubtedly beautiful, but the use of Vegas as a theme has been worn so thin over the decades that it’s impossible to get excited about a new site with the bright lights of Vegas in the background behind suave and elegant looking models, however put together that design may be. It’s a real shame for Dream Vegas, because care and attention to detail has clearly been put in here, but the cliché and frankly tired concept works against it a lot. As one would expect, there’s a lot of gold going on here, but pleasingly the traditional (read derivative) black and gold colour scheme has been sidestepped here in favour of various shades of blue. 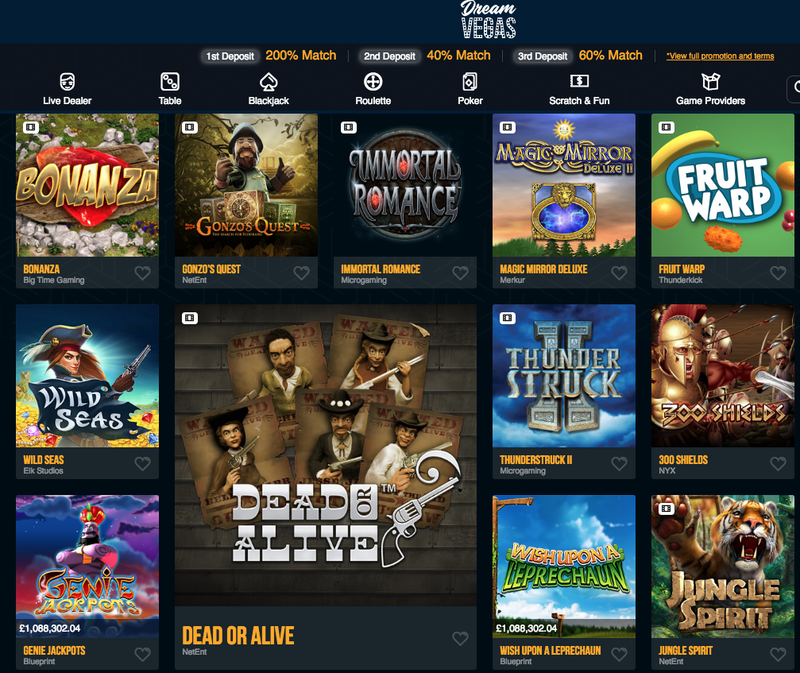 The ghostly images of a roulette wheel and a slot machine appear in the background of the homepage, while navigation is made simple thanks to a wide array of thumbnails offering one-click access to the majority of the titles that are available at the Dream Vegas site. The execution of the theme is excellent here, it’s just a shame that the theme is one we can’t get excited about anymore. Another thing this network is well known for by this stage is offering games from a wide variety of software developers, and in this regard, Dream Vegas may well be even better than its sister sites. Game coming from a huge list ensure everyone has something they will enjoy here, and when we say long list, we mean 1X2 Gaming, 2 By 2 Games, Aristocrat, Blueprint Gaming, Big Time Gaming, ELK Studios, Evolution Gaming, Foxium, Games Warehouse, Inspired Gaming, Just for the Win, Leander, Lightning Box Games, Magic Dreams, Merkur, Microgaming, Multicommerce, NetEnt, NYX, Probability Jones, Quickspin, Rabcat, Sigma Gaming, Seven Deuce, Spieldev, Spike Games, Storm Gaming, and Thunderkick. Whether you like slots, table and card games, or lesser available game categories, you’re not going to struggle to find multiple options that suit what you’re looking for here. The concept of Dream Vegas is disappointing, and may well put off a few players, but those who can handle it, will be rewarded by one of the very best collections of games we’ve seen from a new site in a long time.